Pakistan is bordered by India to the east, Afghanistan to the northwest and Iran to the west while China borders the country in the northeast. The nation is geopolitically placed within some of the most controversial regional boundaries which share disputes and have many-a-times escalated military tensions between the nations, e.g., that of Kashmir with India and the Durand Line with Afghanistan. Its western borders include the Khyber Pass and Bolan Pass that have served as traditional migration routes between Central Eurasia and South Asia. At 796,096 square kilometres (307,374 sq mi), Pakistan is the 36th largest country by area, more than twice the size of the US state of Montana, and slightly larger than the Canadian province of Alberta. Pakistan shares its borders with four neighboring countries – People's Republic of China, Afghanistan, India, and Iran while Tajikistan is separated by thin Wakhan Corridor– adding up to about 6,975 km (4,334.1 mi) in length (excluding the coastal areas). Pakistan borders Afghanistan at the Durand Line, 2,430 km (1,509.9 mi), which runs from the Hindu Kush and the Pamir Mountains. A narrow strip of Afghanistan territory called the Wakhan Corridor extends between Pakistan and Tajikistan. From the eastern tip of the Wakhan Corridor starts the Sino-Pak border between the People's Republic of China and Pakistan spanning about 510 km (316.9 mi). It carries on south-eastward and ends near the Karakoram Pass. This line was determined from 1961 to 1965 in a series of agreements between China and Pakistan and finally on 03-03-1963 both the governments, of Islamabad and Beijing, formally agreed. It is understood that if the dispute over Kashmir is resolved, the border would need to be discussed again. The Pakistan-India ceasefire line runs from the Karakoram Pass west-southwest to a point about 130 kilometers northwest of Lahore. This line, about 770 kilometers long, was arranged with United Nations (UNO) assistance at the end of the Indo-Pakistani War of 1947–48. The ceasefire line came into effect on January 1, 1949, after eighteen months of fighting between Indian forces and Pakistani forces and was last adjusted and agreed upon by the two countries according to the Shimla Agreement of July 2, 1972 between Indira Gandhi and Zulfikar Ali Bhutto. Since then, it has been generally known as the Line of Control or the (LoC). The India–Pakistan border continues irregularly southward for about 1,280 kilometers, following the Radcliffe line, named for Sir Cyril Radcliffe, the head of the British Boundary Commission on the division of the Punjab and Bengal provinces of British India on 13 August 1947. The southern borders are far less contentious than those in northern Pakistan (Kashmir). The Thar Desert in the province of Sindh is separated in the south from the salt flats of the Rann of Kachchh (Kutch) by a boundary that was first delineated in 1923–24. After independence and dissolution of Empire, Independent and free Pakistan contested the southern boundary of Sindh, and a succession of border incidents resulted. They were less dangerous and less widespread, however, than the conflict that erupted in Kashmir in the Indo-Pakistani War of August 1965 started with this decisive core of issues. These southern hostilities were ended by British mediation during Harold Wilson's era, and both sides accepted the award of the Indo-Pakistan Western Boundary Case Tribunal designated by the UN secretary general himself. The tribunal made its award on February 19, 1968; delimiting a line of 403 kilometers that was later demarcated by joint survey teams, Of its original claim of some 9,100 square kilometers, Pakistan was awarded only about 780 square kilometers. Beyond the western terminus of the tribunal's award, the final stretch of Pakistan's border with India is about 80 kilometers long, running east and southeast of Sindh to an inlet of the Arabian Sea. The northern highlands include parts of the Hindu Kush, the Karakoram Range, and the Himalayas. This area includes such famous peaks as K2 (Mount Godwin Austen, at 8,611 meters the second highest peak in the world). More than one-half of the summits are over 4,500 meters, and more than fifty peaks reach above 6,500 meters. Travel through the area is difficult and dangerous, although the government is attempting to develop certain areas into tourist and trekking sites. Because of their rugged topography and the rigors of the climate, the northern highlands and the Himalayas to the east have been formidable barriers to movement into Pakistan throughout history. The name Indus comes from the Sanskrit word sindhu, meaning ocean, from which also come the words Sindh, Hindu, and India. The Indus, one of the great rivers of the world, rises in southwestern Tibet only about 160 kilometres west of the source of the Sutlej River, which first flows through Punjab, India and joins the Indus in Pakistani Punjab, and the Brahmaputra, which runs eastward before turning southwest and flowing through India and, Bangladesh. The catchment area of the Indus is estimated at almost 1 million square kilometres, and all of Pakistan's major rivers—the Kabul, Jhelum and, Chenab—flow into it. The Indus River basin is a large, fertile alluvial plain formed by silt from the Indus. This area has been inhabited by agricultural civilizations for at least 5,000 years. Hydrological power is a renewable resource which benefits Pakistan a lot. After the Indus Water Treaty on 1960 World Bank decided that River Sutlej, Ravi and Beas water will be used by India and River Indus, Jhelum and Chenab water will be used by Pakistan. Pakistan was told to build two dams, one tarbela and second Mangla, five barrages, eight link canals, and one gated siphon. For this, India was told to participate 60%, whereas Pakistan, 40%. Pakistan is considering to develop wind turbines to fulfill the demand for electricity. Solar power is now slowly flourishing but it is still installed on a small scale. Pakistan largest river is known as the Indus River which flows from Tibet/China and enters through Pakistan by Gilgit Baltistan. The Indus River system is divided into two plains. The Upper Indus Plain starts from northern Pakistan and ends up at Mithankot. The Indus has tributaries on both western and eastern side. The Indus' eastern tributaries are the Jhelum, Chenab, Sutlej, Ravi and Beas. These four rivers flow in Punjab and meet at Panjnad where they are known as Panjnad river. The Indus' western tributaries are the Swat, Kabul, Kurrram, Tochi, Gomal, Zhob rivers. These rivers join the Indus at KPK. At Mithankot these rivers finally meet with the River Indus. After this the Indus flows alone through the Lower Indus Plain. Lower Indus Plain starts from Mithankot up to Thatta where the Indus meets with the Arabian Sea. This place is also known as Indus Delta. About 26% of Pakistan's total land area is under cultivation and is watered by one of the largest irrigation systems in the world. The most important crops are tobacco, cotton, wheat, rice, sugarcane, maize, sorghum, millets, pulses, oil seeds, barley, fruits and vegetables, which together account for more than 75% of the value of total crop output. Fishery and fishing industry plays an important role in the national economy of Pakistan. With a coastline of about 1046km, Pakistan has enough fishery resources that remain to be fully developed. It is also a major source of export earning. There are 15 national parks, 72 wildlife sanctuaries, 66 game reserves, 9 marine and littoral protected areas, 19 protected wetlands and a number of other protected grasslands, shrublands, woodlands and natural monuments. -istan (Urdu: ـستان ‎) means land. 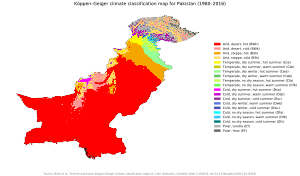 Example: Baltistan, Balochistan. Khel or -khel (Urdu: خیل ‎) denotes a Pashtun sub-tribe. Example: Darra Adam Khel (Urdu: درہ آدم خیل‎). ^ a b "Pakistan: Geography". US Country Studies. Retrieved 2008-05-05.